bpNichol & Wayne Clifford’s long collaboration: Theseus. bpNichol & Wayne Clifford. 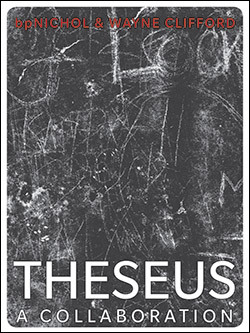 Theseus: A Collaboration (BookThug 2014). From the beginning, bpNichol was an avid collaborator, a believer in the multi-inscribed (& he assumed that even so-called solo writing was multiply authored by the many selves we perform). With The Four Horsemen in sound poetry, Barbara Caruso, among others, in visual work, Steve McCaffery in TRG as well as various sound performances, Nichol could ever be found working/playing with others. One of the first such collaborations began with his meeting Wayne Clifford, his first editor at Coach House in 1966. The idea to use the myth of Theseus as a structural starting point appears to have been Clifford’s, & Nichol soon invited 2 west coast poets to join in the fun. That didn’t work out, so eventually the two poets constructed ‘Part I: Ariadne‘ of Theseus: A Collaboration out of all that had been written by then. Some 10 years later, they picked up the thread of this a-maze-meant & began a long correspondence of writing & rewriting ‘Part Two: Minotaur.’ Then bpNichol died suddenly, far too young, & Wayne Clifford, one of his many best friends eventually wrote ‘A Part Last: Labyrinth‘ as a late collaboration with other writings by Nichol, most especially the martyrology, & as an elegy to one more poet died young. Theseus: A Collaboration is many things, then, not least a wonderful gift to Nichol’s many readers, so long after his death. Clifford & Nichol shared much in their poetics, &, at the beginning, shared also a modernist-Romantic vision that served them well in that first section. It begins: ‘I learn nuance / I gain a sense / of echoes’; soon followed by a questioning of both the ‘I’ & the ‘you’ of the expressive forms of love. A moon appears in the poem, a mirror & a river almost the same, & a quest which is, not so simply, the writing of the poem. The mainly short lines, the spacing, & the yearning felt in the verse all bespeak the poets’ youth. I certainly hear echoes of their early books here, as I also hear echoes of what they had written in the 10 years or so before they began their work on Part Two in that section. By the time they began to work on ‘Part Two: Minotaur,’ Nichol was deep into the early books of the martyrology & Clifford had moved on too, into the complexities of GlassPassages. It doesn’t matter who says ‘that when I opened your envelope, odour of old words / led me empty-headed to the source again’; it does matter that the poem swerves further from that source in myth to the ‘real’ lives of the writers & the real life of writing. We speak her speaking of his heart. There’s also a playfulness readers will recognize from their other writing of the time, as ‘fingers / & what lingers is / the ryme’ soon entertains ‘as f to l shift’s the spell / gesture completes’. Which in ‘A Part Last: Labyrinth,’ Clifford will echo ( along with that early moon & river) in ‘f to l/in/ear’ — a perfect homage to Nichol’s punning in parts of the martyrology. But in this labyrinth of loss, he will also admit, ‘It was mistaken / of us to use / Theseus as thesis / , wrong of me.’ And then demonstrate that this collaborative poem was always more specific, more now, ‘there no(t) here // The distinction between the faces blurred / in the moon, mortal at last no less than // is // us // yes’. Yet at the end, the poem (Clifford’s now if in response to Nichol[‘s writing]) returns to that thread (of what: love? discourse itself? Nichol’s famous ‘speech / each / to / eech’?) & finishes ‘yes you feel it / here / in your h and’. A final lovely & loving bow to his friend. Theseus: A Collaboration is many things & will repay the returning reader, but it is perhaps most forcefully a gift of friendship, as true collaboration always is.